Here’s a story we all love. It’s the one where the hero works long hours at a tedious job to pay the bills, but every penny, every free minute, every lunch break and day off and late night, is spent dreaming and working and building a secret masterpiece. This is Henry Darger’s story, and Vivian Maier’s, and James Hampton’s. Here’s another story, just as popular: the great artist’s work, taken away and vandalized by the vulgarians of the marketplace. This is Terry Gilliam’s, and Erich Von Stroheim’s, and Orson Welles’, over and over again. Now a third kind of story: the leader of the mad, obsessive, doomed enterprise, dragging a crew down with him: Ahab and Aguirre, Don Quixote and Lord Cardigan. At the place where these three kinds of stories intersect is Richard Williams and his monumental unfinished masterpiece, The Thief And The Cobbler. The Thief And The Cobbler should have been the capstone achievement of one of Great Britain’s finest animators. It was the last great hand-drawn animated film, and the final film of many of the greatest animators of the golden age: men whose careers stretched back to Fantasia and Betty Boop. As it went through iteration after iteration over its three decades of development (by my count, it had 10 different working titles over the years, some repeated), it served as a palimpsest and training ground for a new generation of animators. By the time a butchered version of the film finally limped into theaters, it was famous mostly as a financial and artistic debacle. In the years since, it’s become legendary. It’s been the subject of a remarkable documentary by Kevin Schreck, Persistence Of Vision—and an even more remarkable fan restoration project by Garret Gilchrist. Behind this legendary lost film was Williams, a key figure in British animation best known for his groundbreaking work on Who Framed Roger Rabbit, this week’s Movie Of The Week. For nearly 30 years, his obsession with creating the greatest animated film of all time kept him at the center of a maelstrom. I went back the next year and overheard Disney himself talking to a reporter about his animated film about a spaniel, Lady And The Tramp. He was doing a professional number on the reporter, describing how it would pull on your heartstrings when you thought Lady had savaged the baby, but she hadn't. The salesmanship appalled me because I was completely idealistic. He was doing his job, but I wondered why he had to do that. After all, he was Walt Disney. Although Williams has spent the greater part of his life selling financiers, studios, and other animators on his magnum opus, he never seems to have been entirely comfortable dealing with marketplace demands. Whatever his reasons, Williams gave up on animation and moved to Ibiza, where he made his living as a painter for a few years. By the mid-1950s, he was in London, with an idea he thought would work best as an animated film. Using money he made from freelance art and animation work, Williams produced the short “The Little Island,” his first serious work of animation. 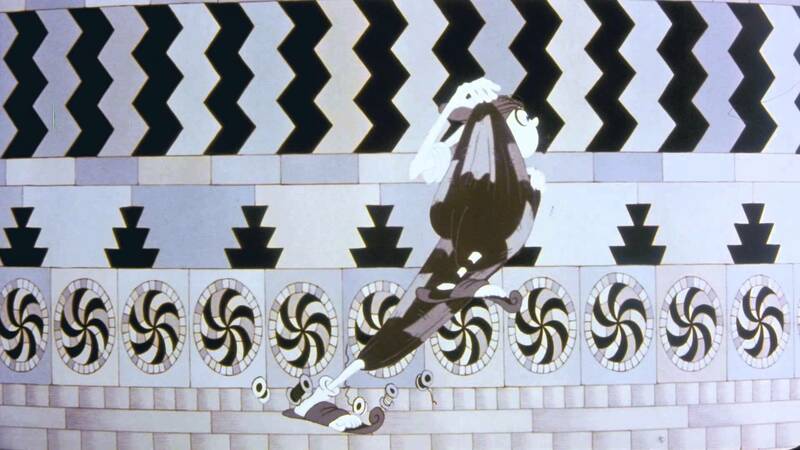 Like much of Williams’ animated work, this has been restored and archived online by Garrett Gilchrist—whose own interest in Williams’ work has now spanned nearly a decade. Released in 1958, The Little Island won Williams a BAFTA and a tour of the European festival circuit, but it didn’t make him any money. It was in the early days at Soho Square that the great work of his life began. Williams, fascinated by Sufism, illustrated an edition of Idries Shah’s translations of the Nasrudin stories. His illustrations for these books are a charming mix of Persian art and cartoon line drawings, and they served as the original art style of The Thief And The Cobbler. The first of the Shah books, The Exploits Of The Incomparable Mulla Nasrudin, wasn’t published until 1966, but there must have always been plans for a feature, because as early as February of 1965, there are references in the press to The Amazing Nasruddin, the working title of what was then to be the first feature film from Richard Williams Animation. Williams hired Idries Shah’s older brother Omar to produce the film and handle business affairs at his studio, and any money Williams made from the studio’s day-to-day work was funneled into his passion project. A 1967 short documentary, The Creative Person: Richard Williams, made for National Educational Television, gives a good picture of his work at this point. Although there’s footage of the jobs that pay the bills—an ad for Peter Evans’ Eating House, the opening credits to Casino Royale—it’s clear from the film that Williams is most excited about Nasrudin. There’s footage of him working late at night, both in his studio and in a home office—his wife reading by his side—on the precursor for The Thief And The Cobbler. Around this time, Williams made one of the pivotal decisions of his life, coaxing Ken Harris, one of Chuck Jones’ animators, out of retirement to work on his film. Harris was responsible for some of the most memorable Bugs Bunny and Wile E. Coyote animations, and his role at Williams’ studio was part employee, part mentor. Throughout the rest of his career, Williams actively recruited and learned from Golden Age animators, since most of their knowledge wasn’t recorded anywhere—Art Babbitt, Emery Hawkins and Grim Natwick all eventually worked with Williams. With Harris, Williams directed a television-special version of A Christmas Carol, which earned him his first Academy Award. But he still had no funding for his Nasrudin film, now titled Nasruddin! In 1972, work on the film came to an abrupt halt as Williams’ relationship with the Shah family soured. Three things seem to have happened at around the same time: Idries Shah’s sister came out of the woodwork, claiming she owned half of the rights to the Nasrudin stories, and threatening to sue; it became apparent to Williams that his arrangement with Idries—promising him half of the film’s revenue—would make a Nasrudin film fiscally untenable; and according to some sources, Williams discovered that Omar Shah had been embezzling. 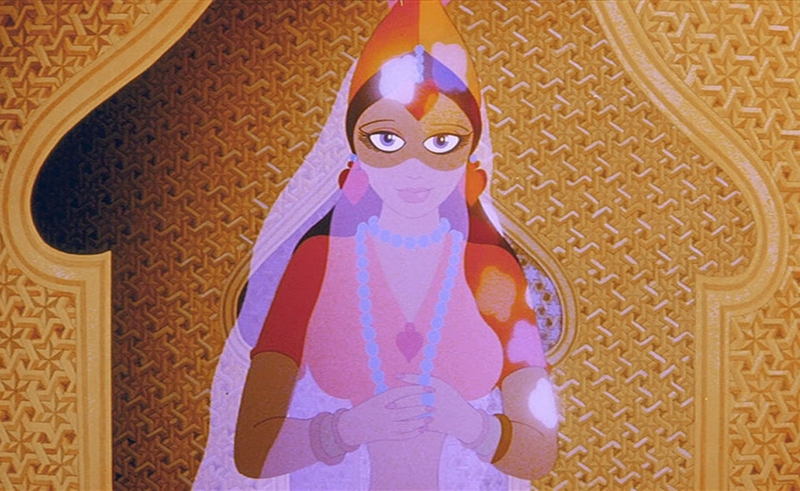 Williams still wanted to make a Middle Eastern-themed film, however, and in 1973, he announced that the studio would throw out everything that belonged to the Shah family, and start again, retaining only the setting and the character of a thief (whom Ken Harris had been animating) that clearly didn’t belong to the Shahs. Little of the original film was salvageable. 1973 was also the year Williams hired Art Babbitt, and made his informal commitment to preserving the art of hand-drawn animation more of a formal arrangement. He shut down the studio for a month and had Babbitt teach his employees, every morning, everything he knew about animation. These were formal classes, with homework assignments and group evaluations, and the animators who were fortunate enough to attend received a grounding in the basics of animation unavailable before or since. Williams was more interested in preserving the art than gaining a competitive advantage; he even invited his competitors to these sessions. Throughout the 1970s, Williams continued working on projects he didn’t care very much about—ad after ad, a Raggedy Ann And Andy movie—while trying to raise money for The Thief And The Cobbler. By the end of the 1970s, he finally got funding from a Saudi prince to create 10 minutes as a demo reel. Known as the “War Machine Sequence,” this is some of the most incredible hand-drawn animation ever created. But he missed deadlines and went over budget, and it wasn’t amazing enough to get Williams the money he was seeking. Still, Williams was able to use it as the basis of a longer demo reel in in the early 1980s, where it attracted the attention Jake Eberts, who agreed to produce the film. It also caught the eyes of Steven Spielberg and Robert Zemeckis, who were looking for someone to direct the animation for Who Framed Roger Rabbit. Because Williams had worked on so many advertisements in different styles, he was a bit of a chameleon, well-suited to mimic the style of the classic cartoons of the 1940s. Two Academy Awards later, Williams once again had Hollywood’s attention. Although he was offered as many as six follow-up projects (including, by some accounts, Beauty And The Beast), there was only one thing he wanted to do next—the same thing he’d wanted to do since the mid-1960s. “It’s got to be the Thief,” he told Variety. “If I miss it now, I think I’m doomed.” He closed his studio to advertising business, and after months of negotiations, made a deal with Warner Bros. to obtain the remaining funding to complete the movie, already more than 20 years after he’d started it. There’s no such thing as free money, however, and the Warner Bros. deal came with a completion bond, a standard form of insurance in the world of independent film production. If a complete film was not delivered to Warner Bros. by an agreed-upon deadline, they had the option of taking a lump-sum payout from the insurance company (in this case, the Completion Bond Company; insuring this production was one of the mistakes that drove them out of business). In the unlikely event of a default, the insurance company would then own the rights to the film. Not that surprisingly, given Williams’ obsessive attention to detail and insistence that The Thief And The Cobbler be the most elaborate animated film ever made, deadlines became a problem. The film was animated at 24 frames per second (12 is more common), and every image was hand-drawn. The amount of work that went into a single sequence, the grand Vizier fanning a deck of cards, was astronomical—each card was individually painted. As one of the animators Kevin Schreck interviewed for Persistence Of Vision put it, “It looked like people died making this film.” And people had: By this point, Ken Harris, Emery Hawkins, and Grim Natwick were gone. As the clock ticked, Williams kept expanding the sequences he liked—meanwhile, other sections of the film were neglected. The working environment seems to have been one of continual crunch time—animators were expected to work long weeks, and turnover was frequent. The deadlines became more urgent when Disney announced it was making Aladdin, its own Middle Eastern epic, with characters who looked suspiciously like the ones in The Thief And The Cobbler. There’s no delicate way to put this: Jafar and his pet parrot in Aladdin bear more than a passing resemblance to Zig Zag and his pet vulture in Williams’ film. The only difference is Zig Zag’s blue skin, which appears in Aladdin on the genie. Warner Bros. started getting nervous. By spring 1992, it became apparent that Williams wasn’t going to be able to beat Disney. Wanting a clearer idea of where the project stood, Warners asked Williams to assemble what he had to screen for executives. Reasonable people can disagree about the status of the version that Williams showed them, but it’s clear it wasn’t what they were expecting. Completed animation is spliced with pencil tests and storyboards, and although many accounts say that only 15 minutes remained to animate, the version online seems less complete than that. The pacing, even in the most frenetic setpieces, is slower than the manic style that Williams himself helped bring back into fashion with Who Framed Roger Rabbit. Scenes with dialogue and exposition are the least finished, as though they’d been added as connective tissue between the spectacular setpieces. In good ways and bad, the film feels like a throwback to an earlier era. Or, actually, several earlier eras. Garrett Gilchrist has traced out many of the influences in more detail, but some characters are animated in a 2-D style of the 1960s that went back to the Nasrudin days, some in a sketchy 1970s fashion, and some in the style of the 1980s and ’90s. It’s clear that Williams was working on a film that would have been unlike any other animation, before or since. It’s also clear that he wasn’t working on a film that would have out-Disneyed Disney, which is what Warner Bros. wanted. In May 1992, Warner Bros. withdrew from the project, and the Completion Bond Company paid back the financiers who had funded the production. The Completion Bond Company was now the proud owner of an incomplete animated film. The company itself was already in crisis—not only The Thief And The Cobbler, but also Spike Lee’s Malcolm X had landed in its lap. Lee was able to raise the money to complete his film, through donations from African-American celebrities, but Richard Williams wasn’t as lucky. Although normally, completion-bond companies will let the creative principals work on the films they seize (albeit under strict supervision), and there was a bid from animation producer Sue Shakespeare to allow Williams to finish his film, the executives at the Completion Bond Company went in another direction. (To be fair to them, Shakespeare’s proposal also involved bringing Terry Gilliam on board, which may have been a great idea creatively, but can’t have been reassuring in terms of cooling the fraught relationship between Williams and his backers.) Instead, the work of completing the film was given to Fred Calvert, whose past work included Saturday morning lowlights like I Am The Greatest: The Adventures Of Muhammad Ali. Calvert finished Williams’ film by farming out some of the animation overseas, adding dialogue, re-editing, and most egregiously, adding some of the most insipid songs in animation history. (The chorus of “She Is More” begins “She is much more than this / There’s a mind in the body of this pretty miss.”) In the end, Jake Eberts bought his way back into the finished project, which his company distributed in South Africa and Australia as The Princess And The Cobbler, to mixed reviews and poor box office. So audiences in those countries saw a butchered version of Richard Williams’ lifelong dream. But the final indignities were yet to come. In December of 1994, Miramax bought the U.S. and Canadian distribution rights to Calvert’s cut of the film. Miramax, never known for respecting filmmakers’ wishes once distribution agreements were signed, proceeded to make the Calvert cut even worse. In an odd twist, now that Aladdin had stolen some of the thunder from The Thief And The Cobbler, Miramax set out to remake The Thief And The Cobbler to be as much like Aladdin as possible. Aladdin wasn’t silent, so The Thief And The Cobbler got more dialogue. Aladdin had pop-culture references, so The Thief And The Cobbler got snarky references to Aladdin. Aladdin had Robin Williams, so The Thief and the Cobbler got Matthew Broderick, Jennifer Beals, and Jonathan Winters. In short, Miramax smoothed out all the things that made the film unique, in the service of producing a pale imitation of a successful movie. The result, retitled Arabian Knight, was an execrable mess, which died a well-deserved death at the box office in late August 1995. Variety called it “the most mishandled pic of the season,” though it’s hard to see what could have been done to sell it. It had a VHS and laserdisc release, but its first DVD release was as a giveaway in boxes of Canadian Froot Loops. Williams, mercifully, has never seen this defacement of what was to have been his masterpiece. And neither has almost anyone else. After the debacle, Williams turned down other opportunities to work on new projects—as he recently told The Guardian, “When you’ve suffered defeat like that you need to get off the battlefield.” In 1995, he began the work that may be his most enduring legacy, teaching The Richard Williams Animation Masterclass, passing on everything he learned over the years from his own work, and from the great animators he’d worked with. Over the rest of the decade, he trained a generation of new animators; with the 2001 publication of The Animator’s Survival Kit, he produced a foundational text for all kinds of animators, hand-drawn and otherwise. (The subtitle is A Manual of Methods, Principles, And Formulas For Classical, Computer, Games, Stop Motion, And Internet Animators, which gives some idea of its scope and range of influence.) The book and classes led to a series of DVDs; there’s even an iPad app. The man who shut down his studio for a month so his employees and competitors could learn everything they could from Art Babbitt is now making sure everything he knows is preserved for future animators. The Thief And The Cobbler has also been rehabilitated over the years. Williams’ workprint quickly obtained legendary status among animators, as a record of some of the finest hand-drawn animation ever created. Blurry VHS bootlegs were passed around and studied for years. In 2006, Gilchrist, amazed by the workprint but unhappy with its poor video quality, edited a version together using the best available material from a wide variety of sources. Gilchrist approaches restoration with the same perfectionism Williams did while making the film—his version, The Thief And The Cobbler: The Recobbled Cut, is on its fourth iteration, as higher-quality sources become available. After years of silence, Williams has finally spoken about the film again—the last version he worked on, the unfinished film that the Completion Bond Company handed to Fred Calvert, has been preserved by the Academy and screened within the last few months both in Los Angeles and, just a few days ago, at the BFI. After years in the wilderness, audiences are finally seeing Richard Williams’ masterpiece in something like the form he originally intended. This ends our Movie Of The Week discussion of Who Framed Roger Rabbit. Don’t miss Tuesday’s Keynote on the immense gambles and difficulties that went into making the film, and Wednesday Forum on the similarites between Roger Rabbit and Chinatown, the question of what Roger Rabbit will look like to the next generation, and more. And tune in next week for our Movie Of The Week discussion of Douglas Sirk’s All That Heaven Allows.